How many times have you had guests visiting your home and been asked to do a magic trick? Wouldn't it be great to be able to do magic with items that are inherently found in your home? This newly designed utility device disguises itself as an ordinary looking tea towel while allowing you to perform amazing feats of magic in your home, in a seemingly impromptu manner. Entertain your family, friends and guests as you are able to make household items magically vanish, appear and change in front of their eyes. You remove an egg from it's carton and cause it to vanish within the folds of a tea towel, only to reappear a moment later back in the egg carton. You drop a bunch of grapes in the folds of the tea towel and cause them to transform into a full glass of wine. You place a fork in the folds of the tea towel and have your guests focus their energy on it. The center of the towel is then seen to mysteriously rise and fall as if it were breathing. A moment later the fork is removed and is seen to have bent itself in an unbelievable manner. The precision made Hell's Tea Towel does most of the work for you and can even be used as a regular tea towel when not in use for a magic trick. 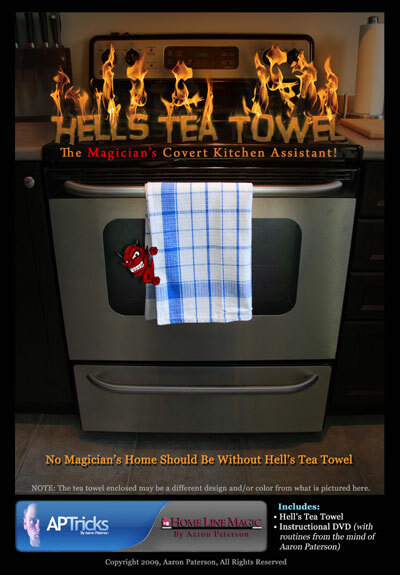 No Magician's Home Should Be Without Hell's Tea Towel Magic Trick by Aaron Paterson and Home Line Magic! Note: The tea towel provided may be a different design and/or color from what is pictured above. Click on the PayPal button below to add this item to your secure Paypal shopping cart. US Dollar Price..........................$39.95 + (Shipping is calculated depending on your location).